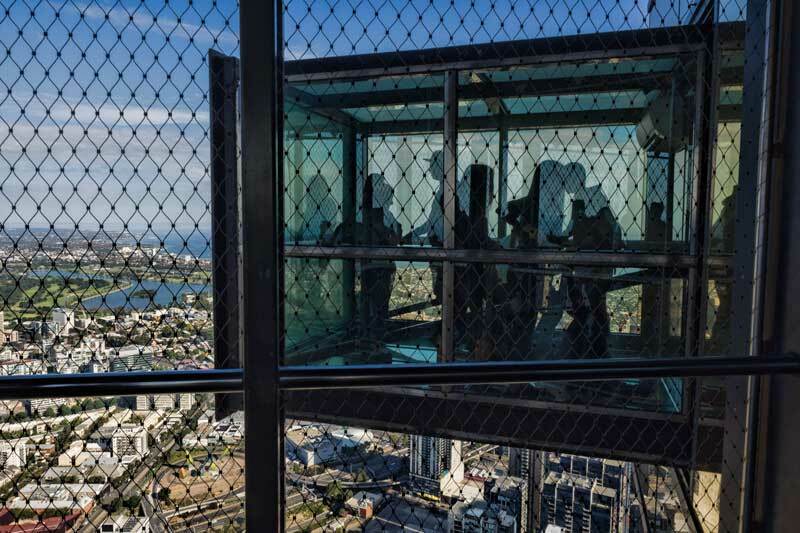 Get a birds eye view of Melbourne city from 285 metres above the ground on the Eureka skydeck or take on the Edge experience if you dare. When you arrive in a new city one of the first things to do is get up high and get your bearings. In Melbourne that means heading for the Eureka Skydeck. Located in Southbank it might not be the tallest building in the southern hemisphere but it is the highest public observation deck at 285 metres up. On our first weekend in the city as soon as the mornings mist cleared and the blue sky appeared we headed up to take a look out over the expanse of the Yarra River, the city and out into the distance. The Skydeck is open from 10 in the morning until 10 at night meaning you have the chance to see it in all light conditions. When we went up to the observation deck at the Umeda building in Osaka, Japan we timed it for late afternoon so we could see the light fade and the lights come on over the city. 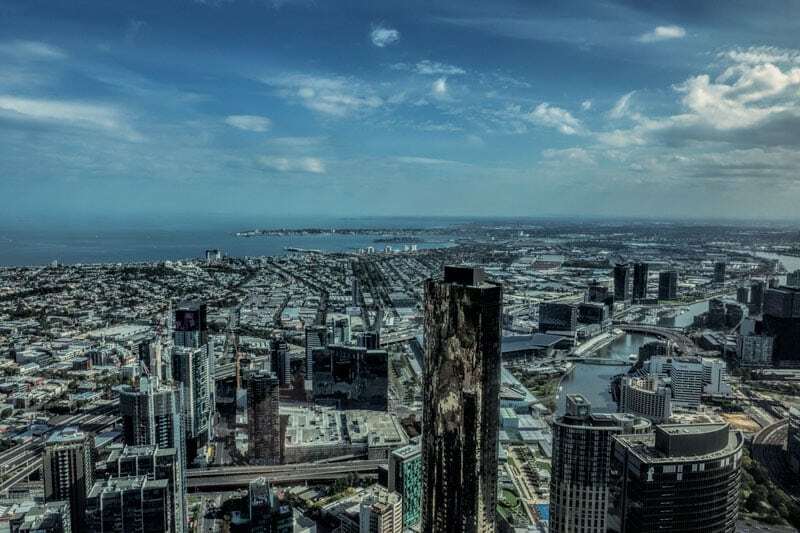 With the Eureka tower you can do even better, there’s a sun and stars ticket that allows a day and night visit either the same day or on consecutive days. Looking up from the base I’m very thankful for the lifts, they are super fast but I’m just feeling blessed that they have them and I’m not about to start counting off the 3680 steps to the top. As it is the lift zooms the 88 flights at a rate of 9 metres a second and has you on level 88 in just 38 seconds, making easy work of it. You exit the lifts to the window area that forms a loop around the windows of the building. The sudden sunshine plus a holiday weekend has brought out the crowds and there are quite a few of us up here meaning there’s a 45 minute wait for our Edge Experience but plenty to see in the meantime. By the time our buzzer goes to summon us to the Edge we haven’t even completed a full circuit. You start with a view out to the southern coast of Australia so it’s fairly easy to orientate yourself from there, to the right is the Great Ocean Road and to the left view you can see out as far as the Dandenong ranges and towards the Yarra Valley, all of which we’ll be visiting on this trip. The flow seemed to be anti-clockwise around the building so we went with that meaning your views go from the coast, around to the ranges in the east, out over the city and river and finally west. While I’m admiring the view from up here I can’t help but think who the heck cleans the windows? Not me that’s for sure, I don’t do windows at all if I can avoid it but there are 52,000 square metres of glass, I mean seriously who keeps them all smear free and sparkling clean? It wasn’t as noticeable from the inside but in the picture of the building below you can see the golden facade on the windows at the top of the tower, this explains the warm glow in a number of our photos and I believe it’s actually 24 carat gold plated glass to reduce the glare. As you continue around the building there’s an outdoor balcony, from there you can get some fresh air but it is enclosed in fencing wire so other than a phone photo where the lens is small enough to focus between the holes there isn’t much opportunity for pictures. I did snap one when I noticed that the Edge pops out right next to it though. The Edge Experience at Eureka Skydeck is an add on experience to your trip up the tower. In small groups you enter a small room that then pushes out from the main building. As the light changes you are standing in a glass cube including the floor and ceiling. It’s quite an experience to look down between you feet at the tiny world below. Something to be aware of though is that there are no cameras, phones or photos allowed to be taken in there other than the one by the static camera which is available for purchase at the end. Overall it’s a great place to get a perspective over Melbourne and especially good when the weather puts on a nice clear afternoon for you. 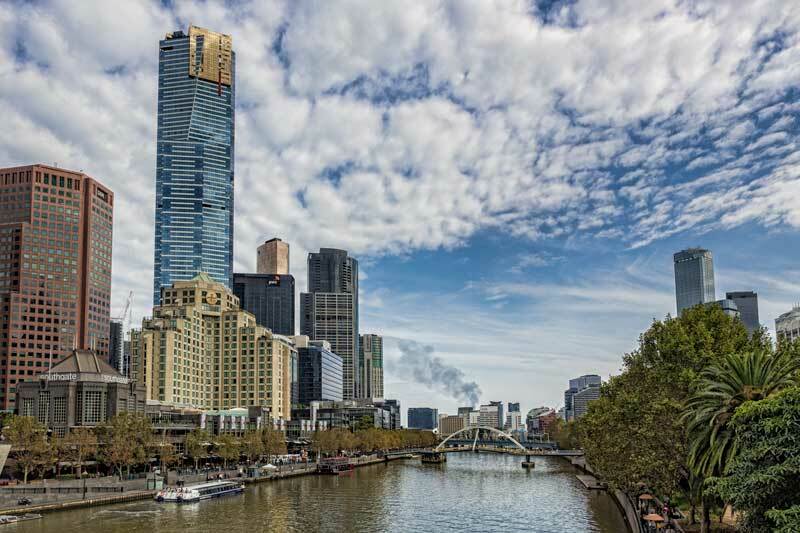 You’ll find the Eureka Skydeck 88 at Riverside Quay, Southbank, Melbourne City. The map below is fully interactive. Zoom in or out to get your bearings or click on ‘view larger map’ to open Google Maps and get directions from your location. Open from 10 am until 10 pm daily. Entry closes at 9.30 pm. The Eureka Skydeck is open every day but reduced operating hours apply on Christmas Day and New Years Day. There are a variety of tickets and package options available. The standard adult entry is $20 and an edge experience if you dare is $12. Find full pricing and current promotions on the official Skydeck website. Interested in the Skydeck? Click on the images below to save the article to Pinterest. Our thanks to Eureka Skydeck for providing the opportunity to experience the Skydeck and Edge on this visit. Fantastic insight into one of Melbourne’s great locations. Eureka Skydeck is a must see for all visitors to our great city! It really doesn’t matter what time of the year you go either, it’s simply brilliant. This sounds awesome, love the idea of standing over the glass- there is something similar at the CN Tower in Toronto. Have been to Melb a few times, but haven’t tried this yet.